On Saturday November 19 my partner and I will head out to a milonga we have been going to for 15 years - ever since we began our tango journey. It is the only milonga in Sydney to have continued in the same venue it has always had - one of the best dance floors in town. 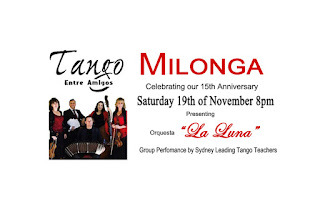 Organised by the son of the founder, together with his wife and a friend it is known as Tango Entre Amigos Marrickville milonga! make time to go to this night of dancing. 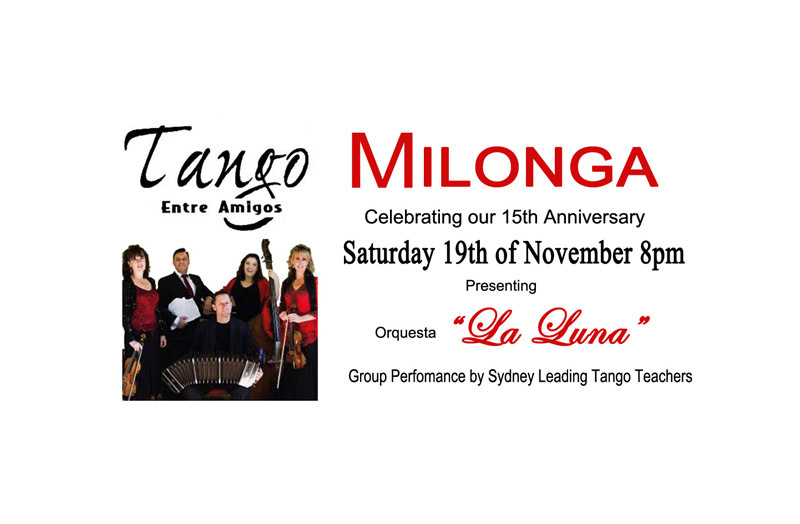 This Saturday, together with the music of DJ Fabian Conca, we will have the pleasure of dancing to the music of the Orquesta 'La Luna', a new tango orchestra established by some of Sydney's most experienced and talented tango musicians. Bookings: Karina Conca, 0414 431 722.